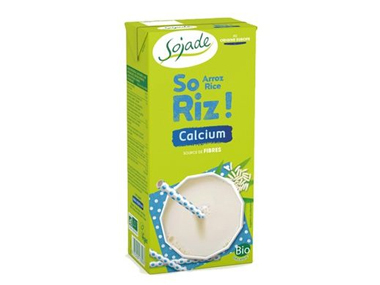 Order Sojade Rice Drink Calcium from the Online Health Food Store UK. Buy Sojade Organic Rice Drink Calcium 1lt and other quality Dairy Free Drinks & Creams safely online in the UK. Rice alternative to milk is a great way of swapping milk for a low calorie drink. Or for those intolerant to lactose and milk. This dairy free alternative to milk can be used for everything. Can be drunk on its own, or added to smoothies or adding to tea or coffee. Milk but without the milk! Made from rice grown in Europe. Our UK Health Shop sells real Sojade and other Dairy Free Drinks & Creams from top-quality brands safely online to customers throughout the United Kingdom in England, Wales, Scotland and Northern-Ireland. View more products on the Online Health Food Store from Sojade. Where to buy Sojade Rice Drink Calcium safely online? Shop at the Online Health Food Store if you are wondering where you can buy Sojade Organic Rice Drink Calcium 1lt safely online in the United Kingdom. Our Health Shop is located in the UK and our award-winning independent has been serving customers in England, Wales, Scotland and Northern-Ireland since 1976. You can buy our Dairy Free Drinks & Creams online and we post out orders to any UK address. Sojade Rice Drink Calcium - Sojade Organic Rice Drink Calcium 1lt in Dairy Free Drinks & Creams and Drinks.